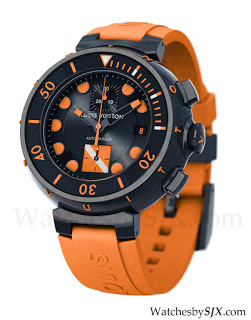 I quite like the Louis Vuitton Tambour dive watch, the original one with the mother-of-pearl second subdial, despite its lack of horological credibility and the branding. 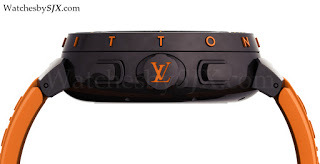 For Only Watch 2011 Louis Vuitton has created a unique Tambour Diving II Chronograph which looks good. According to the press release it has a La Joux-Perret calibre, which I am certain is a Valjoux 7750 modified to have a column wheel instead of cam. The 45.5 mm case is white gold with black PVD coating and is waterproof to 100 m.